Washing hands with soap after using the loo and before eating is the single most effective means of stopping the spread of illness. Men are less likely than women to wash hands following a visit to the loo. “Soap it off or eat it later” —men respond more to disgust invoking ads whereas shaming messages boost handwashing rates among both men and women. Unwashed hands is a major cause of food poisoning globally. Living in a developed country does not mean everything is clean. 95% of Brits claim to wash their hands post toileting—only around 10% actually do. In a Gallup poll, Dutch people came out as dirt divas, being the least likely in Europe to wash their hands post- potty. Global Handwashing Day: 15th October. Soaping up post-potty stops the spread of germs. Centers for Disease Control (CDC) confirms that washing hands with soap after using the loo is the single most effective means of preventing the spread of illness. Even if you don’t touch the actual toilet when you use it, you will have handled the door and lock getting in and out. 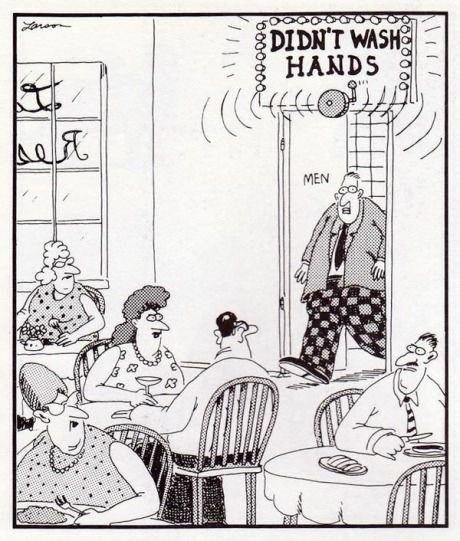 Guys appear to be worse than girls when it comes to washing hands after a bathroom visit. An ad campaign run by the London School of Hygiene and Tropical Medicine monitored handwashing practices of men and women at a gas station in response to electronic adverts. Shame, or peer pressure, seemed to work at getting folks to lather up after lavatory use. The most effective advert was one reading, “Is the person next to you washing with soap?” This boosted handwashing rates among both men and women. It was also noted that, among men, the more people there were in the toilets the more likely blokes were to wash using soap. Guys also responded more to disgust invoking ads, such as, “Soap it off or eat it later” as a prompt for proper hand-washing, whereas women responded to reminders. Gender is not the only predictor of handwashing rates, nationality plays a big part too, with Brits being near the bottom of the polls among developed nations. Although 95% of us say we wash our hands after using the loo, only around 10% of us actually do. Unwashed hands is a major cause of food poisoning. Britons travelling abroad suffer Delhi-belly more than their American, Australian and European counterparts. European countries most concerned with hand hygiene are Bosnia-Herzegovina, Germany and Sweden, with the Dutch being the worst, according to a Gallup International poll. The Dutch are also known for being direct, so maybe they were just more honest than the rest about their handwashing practices. Reasons for reluctance to wash hands among Britons has been postulated to be lack of awareness of its importance, or sheer laziness. Some researchers say it’s neither of those, but rather mindlessness. This is why the shaming tactic is thought to work. If people think their behaviour is being watched, it jolts them into taking appropriate action. Dr. Lisa Ackerley, an environmental hygiene consultant, suggests that people in the UK don’t think they carry any diseases, because, “They live in a country with modern facilities and think things are clean.” This is far from the truth. Hands pick up germs all day long from things we have touched, using the bathroom is a good time to wash some of them away— but only if we use soap. Most of us learned this as children. If you also learned to sing Happy Birthday, then you have a power combo for germ free hands. Singing (silently) Happy Birthday through twice takes 15 seconds— the exact time it takes for ordinary soap to be more effective at removing germs than using hand-sanitizer (thank you CDC). World Hand Hygiene day was 5th May, if you missed that, fear not because Global Handwashing Day is 15th October. Wash your hands before eating and after going to the toilet is the basic message of Global Handwashing day. The message is critical in developing nations where lack of hygiene impacts child mortality, but the message is a good global one to embrace. Don’t forget to use soap!